I’m Tellin’ Mom You Called Me Soupid | Food It Yourself! This is the blog you’ve all been waiting for (even if you didn’t know it). My sister -book/schlocky horror movie reviewer for genexposè- SyllieBee and I have joined forces to create an amazing megapost of doom! 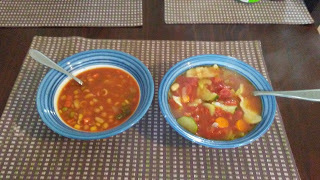 Okay, it’s actually a megapost of soup- minestrone soup. What is minestrone? It’s nothing new, that is certain. It may, in fact, be older than the Roman Empire! In the twenty-first century, minestrone is still a great thing to make and a great thing to eat. It is full of vegetables, something we’re supposed to eat lots of. Traditionally, it is made with whatever is in season and readily available. (In other words the stuff you can get cheap.) Best of all, minestrone construction takes exactly as much time as you have to make it. Don’t believe us? SyllieBee: If you have the time, you can make your own stock – perhaps from ingredients gathered from your own garden, or the local farmer’s market. While it isn’t complicated, making a vat of stock does require some attention to detail and about 8 hours of work. Don’t worry, you can do other things while it’s cooking – while the batch I made for this recipe was simmering, I re-potted my army of spider plants, got my ironing done, made a trip to the hardware store for a few things, and watched a movie. For the difference between stock and broth, check out this great info from the inimitable Alton Brown. For my stock, I started with a trip to my farmer’s market (mostly so I could visit the baby goats, chickens, and other animals). I got a total of 3.5 pounds of bones, 1.5 in lamb ribs and 2 in the form of a cow hip. I added three handfuls of baby carrots that were near the end of their usefulness, the leafy bits of a celery bunch, two small onions that I quartered, and 3 cloves of garlic roughly smashed. For seasoning, I added some peppercorns, a few juniper berries, and three small bay leaves. All the good things waiting to go into the pot. Next: water. Once the bones and veggies and seasoning were in the vat, I added enough COLD water to cover the tallest item by about 1”. Now knowing my total volume, I added salt. My vat holds 14ish quarts (that’s 3.5 gallons). With the pot holding roughly 2.5 gallons of ingredients, I added a shallow palmful of salt – roughly a fat Tablespoon. Getting everything up to a boil took some time, even with my high-output burner. Once it boiled, I gave it a stir and backed the heat way down so it would simmer. This is the last time I had to adjust anything. I checked after 15 minutes to ensure it was just bubbling, gave it another swish, and made sure my lid was set to vent a little. Then I checked on it when I remembered to do so, about once every 60-90 minutes, for the next 7 hours. I turned off the heat and removed the lid, let it cool about an hour, and skimmed off a lot of the fat and scum. Then I fished out lots of the big chunks. 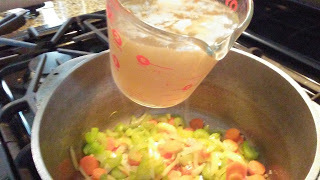 Pouring this much liquid directly from the huge pot would have been awkward, so I used a ladle to get the stock from the vat to the colander, which I set in my next largest pot, and lined with cheesecloth to catch any small icky bits. I then poured the resulting stock into several containers and lidded them loosely before placing them in my refrigerator overnight. I utilized the volcano method: 1.5 cups of flour in a mound on the counter, with a big dent in the middle. I drizzled on about 2 Tbls olive oil, then slowly added cold water and mixed until it became dough. It took a total of about ¾ Cup liquid; your flour may vary. After squishing it around a bit to ensure even consistency, I made it into a ball and let it rest for 30 minutes before rolling it out and cutting it into little ribbons. Incidentally, that pastry cutter is more than twice my age, has a solid brass handle, and hurts like heck when you drop it on your toes. For vegetation: onions, carrots, celery, and garlic all got sliced (or minced) and sautéed in a little oil until soft. 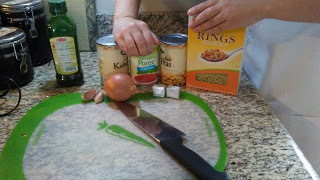 I then added the stock along with a can of diced tomatoes. (Unless it’s August and you can get them from the plants yourself, canned tomatoes are the way to go here). I also added some canned chick peas and white beans (after rinsing off the can goop), a few grinds of black pepper, the last of my home-grown oregano (OK, it was grown at my mom’s home), and brought it up to a boil. Time to add pasta and zucchini! Fresh pasta only takes about 4 minutes to cook, ditto zucchini. Once the pasta was ready, I turned off the heat and let it rest a few minutes before eating. This soup stores really well in both the fridge and freezer, but since it’s great as a main or a side, my guess is leftovers won’t last too long. FoodItYourself: Short on time, energy, and/or money? You can have a big thing to serve (that is literally what “minestrone” means) in just about half an hour made from stuff the typical DIYeter has sitting around. Mise-en-place a la pantry. I had to cover the logo, but these are all store brand items. No need to be elitist- soup is for everyone! 11:31 Add the half onion and two cloves of garlic you just chopped. 11:35 Add water and broth cubes, plus a can of tomato puree. I like to stock up on canned tomatoes when they go on sale. I look for the cans with no added salt. 11:38 Add half a can of chick peas and half a can of cannellini beans. You can use whatever beans you like, just rinse the slimy can stuff off them like SyllieBee said. Now make that stuff boil! 11:48 When boiling begins add some little pasta. I had rings, but pastina, orzo, teeny shells or whatever you have will work just fine. I used two handfuls. Measuring takes too much time. 11:55 When the pasta is nearly cooked, add half of a one pound bag of frozen mixed vegetables, or a little of each kind of frozen vegetable you have in the freezer, or some drained canned vegetables. Use whatever you have. Note the time stamps – not long at all! 12:00 You have soup. Eat it up. The other great thing about minestrone is you can mix and match these recipes. Have your own stock and frozen veggies? No problem. Bullion cubes, fresh pasta, and canned beans? You bet! Mix and match to suit your needs. These rules apply to nearly any soup; doing what you can with what you have is what a DIYet is all about. You don’t even need to end up with a particular kind of soup! You can simply have a kettle full of yumminess with no formal name. It is actually OK to do that. Two bright bowls, alike in recipe but very different regarding the time invested in production. Both are seriously delicious. Soup, Our Food – a Tag-Team Chicken Soup Adventure! There’s more recipes from GenXposé too! Gen has written up the secrets to delicious bread pudding (complete with custard sauce). Havilah has posted a thorough, nostalgic, step-by-step guide for chocolate chip cookies.